I Thought This Was the Age of Peak TV. Why Are the Writers Threatening to Strike Again? Leave a Comment on I Thought This Was the Age of Peak TV. Why Are the Writers Threatening to Strike Again? 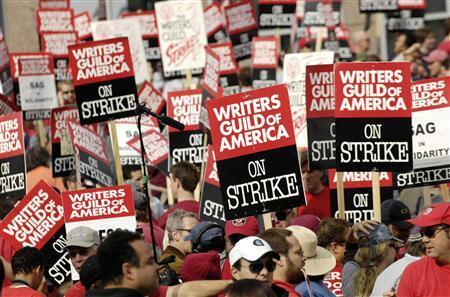 The Writers Guild of America is on the verge of another strike. Remember the last time they did that? Gather around, kids, and listen to a tale about a long-ago time known as 2007. Oh, those were dark days. The world was in the midst of something called The Great Recession, which is when a bunch of greedy banker dicks caused lots of people to lose their homes or jobs or both. We couldn’t even turn to new movies and TV shows for escape because they all ceased production for 100 days after the writers went on strike. They just didn’t think it was fair for their bosses to keep forcing them into doing free work for new online media and then decline to share any residuals. The online world was clearly soon going to replace physical media, and if they didn’t take a stand then they would have been screwed in the long term. Even after they reached a new agreement with the movie and TV producers they still had to spend three years in court to force them to honor that agreement because, well, greedy assholes don’t just exclusively work on Wall Street. But that was back in the olden days, a pre-Marvel Cinematic Universe, um, universe. Netflix’s streaming service was still in its infancy, and the top 10 movies in any given year still included at least a couple of original, non-sequels. Things are different now. We are in the age of peak TV and peak blockbuster, a time when there are significantly more TV shows and big movies than at any other point in media history. This must clearly be a boon period for anyone wanting to work in the industry. So, whey the heck are the writers talking about a strike? The latest, if you haven’t heard, is that negotiations between the WGA and Alliance of Motion Pictures & Televisions Producers have broken down after 12 days of minimal progress. Now, the WGA has sent out a letter to its 12,000 members recommending a vote be taken to authorize a strike. If such a vote happens and is successful it won’t immediately put them on strike; it’ll simply authorize a strike to commence should the WGA see no other option. For now, it’s simply a hard line negotiating tactic, but it could lead to the first work stoppage in a decade. Ok. It’s more that Netflix has significantly altered consumption patterns, and the rest of the industry has responded by shifting toward producing shorter seasons meaning while there are more shows there are fewer episodes and thus lower overall pay for the writers. It’s best if a lawyer explains it to you. Hey, Jonathan Handel, LA entertainment attorney who moonlights with The Hollywood Reporter and was recently interviewed on this topic by The Frame, you want to take this? Additionally, the WGA has informed its members that the producers are playing hard ball on the union’s much vaunted pension and health plans, including he following summation in the letter requesting strike authorization: “In response to our proposal to protect our Pension and Health Plans, this has been [the AMPTP’s] answer: Nothing on Pension. And on our Health Plan, two big rollbacks.” That might be because the health plan has run deficits over the past two years. Funny how that sounds exactly like something someone would have said prior to the 100-day strike of 2007/2008. The Screen Actors Guild is surely watching all of this very closely because the same exact Peak TV problem of not being allowed to work while being held on a series plagues actors as well as writers.